The Waverly, a three-story frame Queen Anne style inn, sits on a narrow city lot at 783 North Main Street, on the west side of the street just north of the Claddagh Inn and separated from that inn by a paved parking lot that the two inns share. The handsome building was erected shortly after 1898 as a two-and-a-half story hotel with a one-story porch. Following a fire about 1910 that did extensive roof damage, the walls were extended up to create a third story, where the multiple dormered windows had been, and the original deck on hip roof with its two projecting interior brick chimneys was repaired. At this time, a second story porch was added above the main facade porch in the same gay Queen Anne design. With the exception of the c. 1940 addition of a one-story frame wing containing four additional guest rooms; an upstairs bath added outside the main block above this wing; the removal of the railing around the roof deck and on the south side or the porch; and the enclosure of the porch bay adjacent to the dining room wing, the exterior of the Waverly has undergone no changes since the post-fire remodeling and is in remarkably pristine condition. The inn rests on a high quarried stone basement, is covered in plain siding, and has a pressed tin roof on the main block and porches. Windows are one-over-one sash with wide plain surrounds with a molded drip cap. Those on the main facade have louvered shutters (replacements of earlier louvered shutters). The main entrance, in the center bay or the main (east) elevation, is the original double paneled and glazed door, set in an ornamental surround with fluted pilasters with applied floral jigsawn trim and a central jigsawn impost block with an applied three-leaf clover motif on the lintel over the door. The first story porch wraps around the north side to a one-story dining room wing. The central bay is pedimented, with paired turned posts with quarter-fan shaped brackets, and at the corners the posts are tripled. The entire porch has a railing with turned balusters and plain rails. The second story porch, three bays wide, echos the main porch. Above the main entrance, a single door with a transom and sidelights opens out onto the second story porch. The interior of the Waverly is equally well-preserved. On the first floor, rooms are arranged around a wide center hall with an arched spindle screen opening into the cross hall, which angles to the south, housing a magnificent Eastlake style stair, which rises against the back wall of the transverse hall in two flights with a landing. The dark stained balustrade has pointed arch motifs on top of turned spindles, with massive square newel posts with intricate moldings and a turned ball termination. The closed string is decorated with latticework panels. Beneath the staircase is the original registration desk. The parlor is located in the north front corner, and the dining room is behind it. Twenty-one guest rooms, with seventeen bathrooms, are located on the south side of the first floor, off the wide center hall on the second floor and third floor, and in the added rear wing. All of the original symmetrically molded door surrounds, similar to that of the front door, survive, and vary slightly on each floor. The first floor door surrounds have corner blocks with triangular caps with circular and fleur-de-lis applied motifs, the second floor has simpler versions of the first floor, and the third floor has bullseye corner blocks. Doors are original, with five raised panels and transoms. Several of the first floor rooms are connected with pocket doors. The original bathrooms are located at the rear of the second and third floor halls, but on the second floor a bath has been added in each guest room. On the third floor, each original large guest room has been subdivided into two smaller guest rooms. The weather lock at the hall entrance, the halls and stairs, and the dining room all display narrow beaded, vertical beard wainscotting. All rooms are furnished with molded baseboards and picture rails. Guest rooms have secondary louvered doors. Rooms adjacent to the two chimneys have coal fireplaces with simple bracketed late Victorian mantels. The parlor mantel is embellished with colonnettes. The fireplace covers are brass. On January 1, 1898, J. F. Maloney and wife J. T. sold the less than one acre lot in Hendersonville to Maggie Anderson for $5,375.00 (Henderson County Deed Book 38, p. 50). She constructed the building soon afterward, calling it the Anderson Boarding House. Sometime after 1910, the upper one-and-a-half stories were damaged by fire. The repairs changed the Waverly to its current appearance. A documentary shows the hotel as originally 2½ stories with a row of gabled dormers circling the hipped roof and a single tier porch. The Anderson Boarding House became the Waverly before 1915, since the Hendersonville city directory of that year lists it by that name at 783 N. Main Street. On November 26, 1926, Maggie Anderson sold half interest in the property to her sister, Bessie A. Egerton. The sisters were among the numerous victims of the Depression, losing the hotel on the courthouse steps on February 1, 1930. It was bought by the Vacar Realty Company of Richmond, Virginia for $10,000.00. Four years later on September 22, 1934, this same company sold it back to Maggie Anderson and Bessie Egerton. George B. Killen and wife Louise bought the Waverly for $10.00 and the assumption of an $8,200.00 note held by The Home Owners' Loan Corporation on June 26, 1938. The Waverly had several subsequent owners, one of which, M. U. McCurry, also owned Chewning House, which is located next door and separated by a parking lot. The current owner, John S. Sheiry, Jr., bought the property on June 13, 1988. 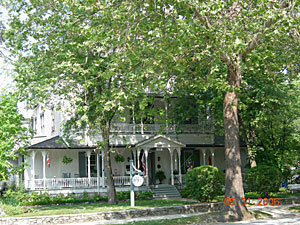 He continues the Waverly's tradition of service as an inn to visitors and residents of Hendersonville.